BodySpace Member Of The Month - TheNaturalOne! Who doesn't know about this guy by now? 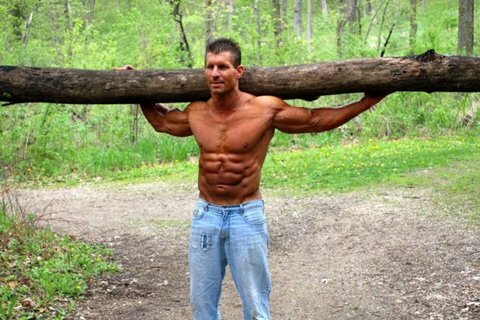 Chad Shaw is among the most popular Bodyspace members there has ever been. His impact on the industry has been felt worldwide in a relatively short amount of time. His photos are almost iconic and he is as impressive as a person, if not more so, than his physique is. That is pretty impressive. Check out our interview with "Thenaturalone" and congratulate him for being the latest Bodyspace Member of the Month. If Not More So, Than His Physique Is. My name is Chad Shaw, AKA-thenaturalone on BodySpace. I'm 36 years old, and I'm from Wisconsin. I've been visiting Bodybuilding.com, and using Bodyspace for over 3 years now. I was actually flipping through a magazine one day, and saw an ad for Bodyspace, and became curious. I decided to check it out, not knowing at the time that it would be one of the best decisions I ever made. 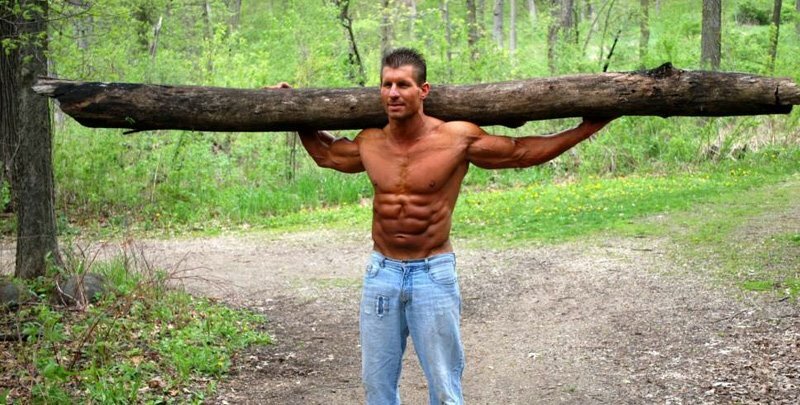 At the time, I felt as though I was in pretty good shape, but let's face it, living in Wisconsin I had a slightly distorted idea of what being in great shape really was. I was around 18% body fat, but to people around me I was considered in pretty good shape. It's no big secret that Wisconsinites like their beer, brats, and cheese! The first time I checked out Bodyspace, I was amazed by all the spectacular physiques the members possessed! They made me realize just how in shape I wasn't! I went ahead and created an account on the site and began tracking my progress. All the members on Bodyspace were so supportive, and encouraging that my motivation reached an all time high! Thanks to Bodyspace I was able to achieve the best shape of my life in a significantly short time frame. Thanks To Bodyspace I Was Able To Achieve The Best Shape Of My Life. I've met quite a few Body- spacers in person. I've met rocklockridge (writer Roger Lockridge); amysuds; stevep78; beautifulgrace, 31233 (Tiffany); Dedicatedforlife; FitnessDiva22; JamieEason; IThinkFit; MoJoFit; TheBeastWCBB; jennyj242; and AntonioWright, just to name a few. I also met some great people who work for Bodybuilding.com. Kris Gethin, who is the editor in chief for the website, and also the author of the top selling book Body by Design, along with Richard Barnet, James Murray, Jerome Ferguson, and a few of the people who work with the media and website. I just can't say enough about how wonderful all these people are, as well as all the spectacular people I've met on Bodyspace. All of these people have their hearts in the right place and are very passionate about what they do! You can't help but be inspired by all their positive energy. I work for GE Healthcare as a repair technician for electronic vaporizers. For those who aren't familiar, vaporizers are the units attached to anesthesia machines that dispense the vapor drug which puts you to sleep before having surgery. It isn't my dream job, however, I am thankful to have a job that allows me to make ends meet, and provides me with good health insurance. Anyone who is familiar with my tragic health history can completely understand my need for good health insurance! I also write articles for Bodybuilding.com and World Physique magazine. Writing is a hobby at this point. I would love to apply it as a career one day. For those who aren't familiar with my background, I was born with many vicious health maladies. Here is a quick run-down on the health issues I've dealt with, and still dealing with a few of them: Severe, chronic, asthma and allergies; a 4 inch leg length difference between my right, and left leg; spinal scoliosis; 4 torn spinal disks; 2 bulged disks; missing anterior cruciate ligament in right knee; missing medial meniscus in right knee; osteoarthritis in right knee; torn ulnar nerve in right arm; detached proximal bicep tendon in right arm; and parathyroid disease. I know all too well what it's like to be on the edge of death just waiting for your very last ounce of life to be taken away from me. I know how it feels to be told my medical professionals that I'm going to die. I know what it's like to feel that all hope is lost, and that everything I had dreamed of my life becoming would never be realized because I was relentlessly being crushed by a disease that nobody could control. To Apply It As A Career One Day. Time and time again, by the grace of God, and skin of my teeth, I barely survived. About the time I would start to physically recover and begin to gain hope, then BAM! Another health issue would smack me! So at that point doctors were no longer telling that I was going to die, but they were telling me that I would never physically be able to become an athlete, or even lift weights. Although it was great to have cheated death on multiple occasions, it was devastating to not be able to pursue any of dreams that I had! Throughout my childhood, I spent more time in hospitals, and doctors' offices than I did at home, and in school put together. I finally reached a critical point in my life where I just said I had enough of this! I was sick and tired of being told I can't do this, and I can't do that! I just couldn't accept that anymore! I made the decision that I was going to turn tide. I didn't care what doctors said anymore, I was going to persevere, and do what they said I could never do! I was going to show them that all that my destiny wasn't going to be controlled by what their medical journals, charts, and graphs said it would be! I was going to make them re-write all the books! After spending the vast majority of my life feeling, weak, pathetic, and defenseless, I became hell-bent on becoming the opposite of all those things. I wanted to be strong, healthy, and physically be able do things that most people couldn't. These are the events that brought me to where I am today. The most important thing I've learned is that you really need to be careful of who, and where you get advice from! If you're at the gym, and you see a guy standing about 5'6", and weighing about 250 lbs, at around 6% body fat, he is not the person you want to ask for advice! He will tell you how to overtrain, and over eat! What he won't tell you is that he is pumping himself full of steroids, and growth hormones! The training and nutrition philosophies in this industry have been drastically skewed by wide-spread steroid use. I want to make it very clear that there is a very definite difference between how a natural athlete should train, and eat, versus an athlete using chemical enhancements! To Be Careful Of Who, And Where You Get Advice From. When first began training, I would follow workout routines that were written by IFBB pro body builders in muscle magazines. These were marathon workouts that would take 2-3 hours just to get through 1 workout. These routines had you training each muscle group up to 3 times per week. The harder, and longer you trained, the bigger muscles you would develop, is what I was learning from these magazines. I followed these workouts enthusiastically for quite some time. I trained, and trained, until I trained myself right into a whole gauntlet of injuries which were the results of overtraining! Not to mention the muscle gains I made were very minimal. At the time I had no idea what steroids were, or what they did. I assumed that maybe I just wasn't seeing good results from these workouts because my genetics sucked! LOL! I laugh looking back on how ignorant I was. I later learned what exactly steroids were, and who was using them. I learned just how drastically steroids could alter the chemistry of the body by greatly enhancing protein synthesis, and nitrogen retention way beyond normal limits. As a result, anyone using steroids can endure a much higher volume, and frequency of training, and make huge muscle gains without overtraining. Not to mention, they can afford much less digression when it comes to making dietary choices, because their metabolic rates run much higher than that of a natural athlete. People trying to gain muscle naturally need to be very cautious about overtraining! I'm often criticized because of how much recovery time I incorporate into my training regimen. The difference between me, and the people that I know of who scrutinize me for incorporating extra recovery time, is that I keep making muscle gains, and they don't. I'm not here to place judgment on those who are using chemical enhancements. I know some guys who use enhancements that are really great people. Reality is, that most people including myself, would rather not take the health risks associated with steroid use, and prefer to follow the natural path. With that being said, it's very important to acknowledge that there are vast metabolic differences between those who train naturally, and those who use chemical enhancements. Those differences determine what training and dietary strategies you should follow in order to develop your physique. To Be Very Cautious About Overtraining. [ Q ] What is your favorite bodypart to train and why? I would have to say biceps. I know, big surprise coming from a guy! I guess because my most prominent veins in my body are in my arms, and when I train biceps, I love watching all those big veins pop out! I aim to draw as much blood as possible on every set! [ Q ] What is the best fitness advice you could give to someone who is just starting? The best advice I could give to someone is to be patient! I meet lots of young bodybuilders that want to have it all overnight. Building muscle naturally takes a lot of time and hard work! I was no different when I was younger, but I learned the hard way. When I first began training, I hit the ground running! I wanted to force things to happen too fast, and ultimately that mind-set resulted in numerous injuries. Just as it is important to have the discipline to get yourself in the gym, it is equally as important to possess the discipline to keep yourself out of the gym, so that you're not going in and tearing up muscle tissue that hasn't had the opportunity to fully recover. I would say overtraining is at least 90% responsible for people failing to reach their goals. I see it all the time. These young guys show up at the gym and train chest, and arms every single day! Weeks, turn into months, and they see little or no muscle gain. They become discouraged and quit. I see other guys that do the same thing, but only they end up injuring themselves badly as a result of overtraining. The end result remains the same, they become discouraged and quit. The Best Advice I Could Give To Someone Is To Be Patient. If you're serious about transforming your body, you need to understand that it's a long term commitment you must make with yourself! There is allot more to it than just showing up at the gym. Body building is a multifaceted effort that requires tremendous discipline. Not just discipline to train intensely, but also the discipline to adhere to a clean, and precise nutritional plan, being consistent with your supplement regimen, taking the necessary recovery time between workouts, and giving your body enough rest. In the 25 years I've been training, I've made lots of mistakes. As I mentioned before, the biggest mistake I made was over training. The next biggest mistake I made was sacrificing form in order to lift heavier weights. Both of these mistakes will inevitably pave the path leading to injuries. [ Q ] What is your favorite part about Bodyspace? Oh that's an easy one! Motivation! I can't even begin to express all the positive energy that is generated off of Bodyspace! There are so many awesome individuals on the site who are so encouraging and supportive! It's really an amazing thing! Even just seeing these people on Bodyspace who are tired of being out of shape, and are now committed to working hard, and busting their butts to get themselves in shape is very motivating! I know I wouldn't be where I'm at today had it not been for Bodyspace! I'm currently in the process of creating a website. It will be coming soon so look for the posting on my Bodyspace page. I have lots of plans for the website! I will be gradually adding content to the site in order to help inspire, motivate, and educate, visitors of the site. The site will be a great tool to help teach people my secrets to building a lean, muscular, and healthy physique! Besides that, I will always be aiming to take my physique to that next level! That Is Generated Off Of Bodyspace. I receive a very high volume of private messages on Bodyspace. With my work schedule, training schedule, and taking care of my household duties, I'm left with a very limited time frame each day to answer private messages. I try very hard to answer as many messages as I can in the spare time that I have. I want to apologize to anyone out there who has written me that I haven't gotten back to! Please understand that it's nothing deliberate, or personal, it's just a matter of there not being enough hours in the day to address them all. I do the best that I can, and I hope sometime down the road I will have more free time in my schedule to answer a higher volume of questions for Bodyspace members. One of my goals for my website is to provide answers for the most common questions that I receive. That way I can help larger volumes of people at one time. I also want to thank all those Bodyspace members out there who have listed me as one of their most inspiring members! I've read each and every heart-felt comment and I sincerely appreciate all the kind words from everyone! One last thing I want to say is that regardless of whatever obstacles, or adversities come your way, never let anyone, or anything derail you off of the path you are traveling that is leading you to your ultimate goals! Life is no Nintendo game! If you waste your life on could haves, should haves, and making up excuses, then that's it! You don't get to start over again! You only get one life here on this earth so make it the very best life that it can be! Under no circumstances should you ever abandon your dreams! Go after them relentlessly! No excuses!